Public health is the responsibility of every nurse and nursing practice should adopt a life course approach to the promotion of health and well-being. This approach requires a renewed focus on health promotion interventions aimed at older people, including those resident in nursing homes. The oral health status of older people in nursing homes has been reported as suboptimal, predisposing them to poorer health-related quality of life. Interventions focusing on knowledge and behaviours related to oral health management for nurses, other caregivers and older people have the potential to improve the provision of oral care. 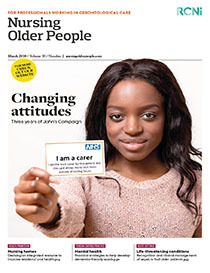 This article discusses a project undertaken by a team of preregistration nursing students to plan and develop an integrated oral health promotion resource for older people in nursing homes. Healthy Smile, Healthy Me comprises a poster called five steps for oral hygiene and an oral health box. Initial feedback from a pilot of the resource in a nursing home is encouraging and research is planned to explore the feasibility, acceptability and efficacy of the resource.